Berliner Weisse, not to mention a few other once barely heard of sour styles, are becoming commonplace in the craftier realms of the Aussie beer world these days. Yet it's not that long ago that they were rarer than hen's teeth: just five years ago, the world was yet to meet Watermelon Warhead, for example. Among those pioneering brewers sour fans can thank for their introduction is Matt Houghton of Boatroacker. 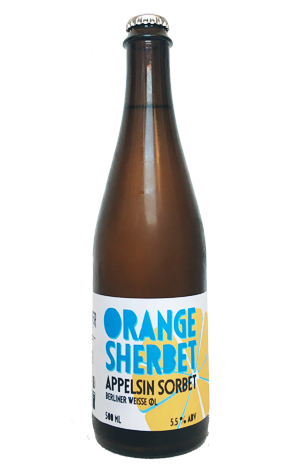 Not long after commissioning his Braeside brewery he released Mitte, the Chardonnay barrel-aged "straight" Berliner Weisse, and Orange Sherbet, a beer originally created in collaboration with fellow sour fan Tobias Jensen of To Øl, then in Melbourne for Good Beer Week. It's been a while since the beer was spotted, but a fresh batch has landed at the end of summer. It's a naturally soured wheat beer that has also spent time in freshly emptied Chardonnay barrels to which were added bitter orange and a strain of Brettanomyces. What that results in, once it hits your glass in hazy pale gold fashion, is a beer with an acidic sharpness, some Bretty funk and a grippy sourness. Yet, when that upfront impact subsides (and as the beer warms), it reveals more of the citrus, a lemony malt sweetness and a reminder of the barrels in which it spent time.